Throw out the clunky projectors and transform your surroundings into a mind-blowing cinema with the RIF6 CUBE Mobile Projector. 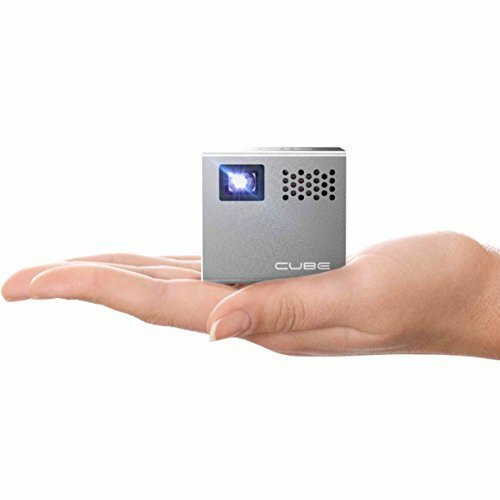 A new kind of mini projector crafted from weightless aluminum, and equipped with 120 inches of vivid projection display. Designed with built-in 90-minute battery, 20,000 hrs bright LED bulb, clear audio speaker, air ventilation and adjustable focus knob on the side. Incredibly lightweight and compact, and fits in any briefcase, laptop bag, purse or pouch for easy access. A perfect companion for a smart phone, camera, laptop or tablet. The micro SD card slot, HDMI, and MHL inputs allow you to connect almost any portable device for travel size, big screen entertainment anywhere. Use the onboard media player to project 1080 megapixel image and movies directly from a USB stick or Micro SD Card. This gadget is also great in an office or school setting for a powerpoint presentation. Truly an amazing device for limitless multimedia possibilities.